Fidelity Spartan 500 Index Fund (FUSEX) is an investor class of U.S. domestic stock mutual fund. This index fund is classified as large blend fund. Index mutual fund has become more popular nowadays for investor. For 2011, most of the index fund has outperformed other actively managed mutual funds. One of the well-known index funds is Fidelity Spartan 500 Index fund. This mutual fund is tracking S&P 500 index which consists mainly the large cap US companies. The fund’s review is described below. Fidelity Spartan 500 Index Fund (FUSEX) is an investor class of U.S. domestic stock mutual fund. This index fund is classified as large blend fund. It has low expense ratio fee. The Fidelity Spartan 500 Index fund is seeking to provide investment results that correspond to the total return performance of common stocks publicly traded in the U.S. The fund invests most of assets (>80%) in common stocks included in the S&P 500 Index. 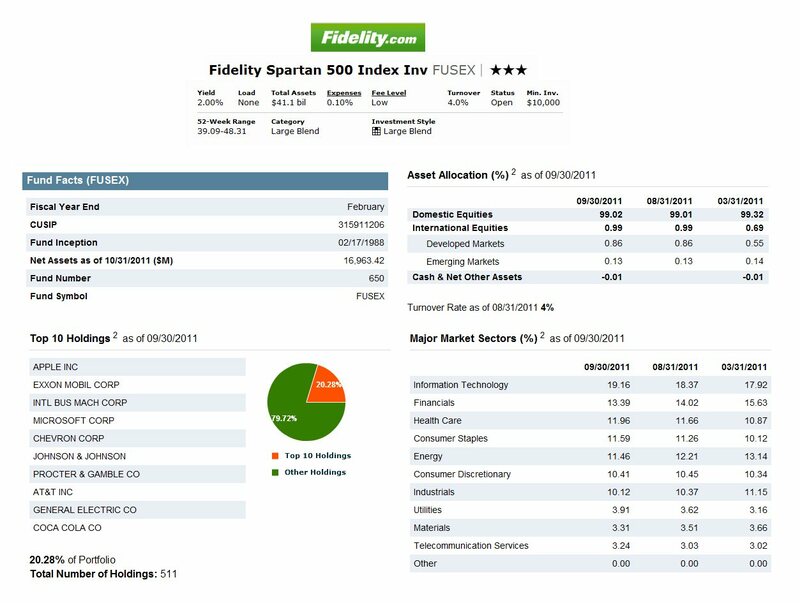 This Fidelity Spartan 500 Index Investor Fund was formerly known as the Spartan US Equity Fund. This fund was incepted on February 17, 1988. This stock fund is passively managed by Jeffrey Adams. He has been with this fund since March 2005. This fund has total net assets of $41.14 billion. The fund has dividend yield of 2.00%. The most recent distribution was in October 7, 2011 ($0.22). The annual expense ratio of this fund is very low (0.10%) if compared to the average in the Large Blend category (1.14%). This Fidelity equity fund has received 3-stars rating from Morningstar. The YTD return is 1.24%. Based on the load adjusted return, the fund has returned 8.00% over the past year, 0.20% over the past 5-year and 3.61% over the past 10-year. This FUSEX fund has 17 years of positive return and 5 years of negative return. The best 1-year total return was recorded in 1997 with 33.04%. This FUSEX fund is a NTF fund (No-Transaction-Fee). It means there is no 12b1 fee and no front-end sales load fee. To open a brokerage or IRA account for this large blend stock fund, investor will need a minimum initial investment of $10,000. This Fidelity fund is available for purchase through 78 brokerages such as E Trade Financial, JP Morgan, Schwab Institutional and Retail, Fidelity Retail Funds Network, Mony Securities Corp, Raymond James, Firstrade, etc. The other class is Fidelity Advantage Class (FUSVX). The annual expense ratio of FUSVX is 0.07%. As of September 30, 2011, this Fidelity fund has 511 total holdings. The top 10 holdings represent 20.28% of the total portfolio. They are Apple Inc, Exxon Mobil Corp, International Business Machines Corp (IBM), Microsoft Corp, Chevron Corp, Johnson & Johnson, Procter & Gamble Co, AT&T Inc, General Electric Co and Coca Cola Co. The 5 major market sectors are Information Technology (19.16%), Financials (13.39%), Health Care (11.96%), Consumer Staples (11.59%) and Energy (11.46%). The principal risks for investing in this fund are Stock Market Volatility, Issuer-Specific Changes, Correlation to Index, etc.